A star sapphire within a cluster of rose diamonds and chased gold laurel leaves surmounts this trois-couleur (three colors) gold egg which is enameled a translucent pink on a guilloche (1) pattern of repeated stars. The egg is divided into twelve panels by broad bands consisting each of a line of rose diamonds within continuous laurel leaf borders chased in gold, an emerald is set at each intersection of the lines of rose diamonds. 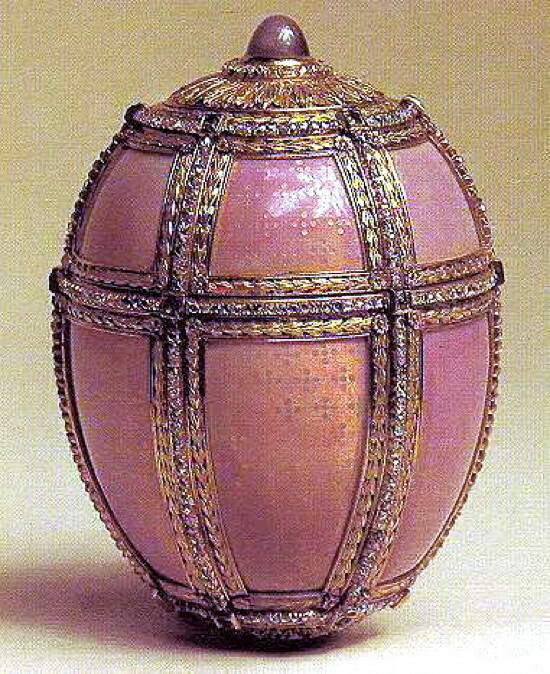 This is one of the ten imperial Eggs sold in 1930 by the Antikvariat to the Hammer Galleries, New York. Between 1937 and 1953 it was owned by Mr. & Mrs. Nicholas Ludwig, New York. In 1962 was sold to a Private Collection, United States. It was bought in 1972 by Matilda Geddings Gray foundation, New Orleans Museum of Art, Louisiana. Inside is the surprise - a folding screen of 10 miniatures painted by Krijitski in 1890, framed in multi-colored gold is recessed within the egg. Painted with watercolor on mother-of-pearl, eight of the ten panels depict palaces and residences that Princess Dagmar had known in her native Denmark before she married Alexander in 1866. 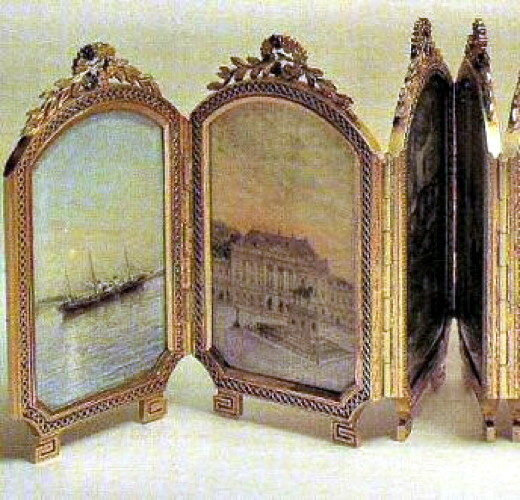 The panels depict, from left to right, Imperial yacht Polar Star, Amalienborg Palace, Copenhagen, Estate of Hvidøre near Copenhagen, The Summer Residence of Fredensborg Castle, Bernsdorff Castle, Copenhagen, Kronborg Castle, Elsinore, Two views of the Cottage Palace, Alexandria Park, Peterhof, Gatchina Palace, near St. Petersburg and the Imperial yacht "Tsarevna". Click here to see the ten panels. The third panel from left depicts the seaside estate of the Hvidøre near Copenhagen. It was to this estate that the Dowager Empress came after her excape from The Crimea in 1919. She died at Hvidøre in 1928. (1) Guilloche = a decorative design in which two or more curved lines or bands are interwoven, forming a series of spaces between them.